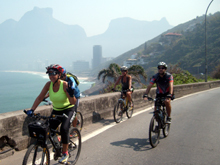 Bicycle tour in the city of Rio de Janeiro who run the main natural attractions, historical and touristic the city wonderful. 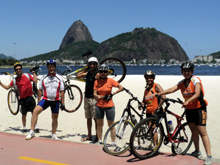 We prepare itineraries for cyclists of all levels and modalities. 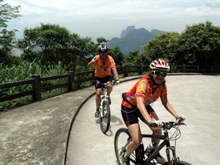 Bilingual tour guides specializing in cycling, equipped and able to assist cyclists in basic bicycle mechanics and first aid, to lead the group with fun and safety. An unforgettable experience and healthy for the whole family. 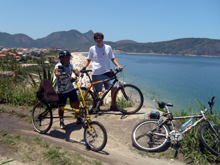 We provide transportation and bicycle rentals and equipment. We create custom itineraries for groups of different sizes and unique characteristics. 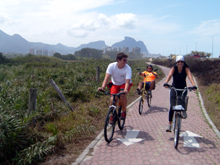 We also have bicycle tours in other towns. Please contact us for more information. Beaches of Flamengo, Botafogo, Leme, Copacabana, Ipanema and Leblon. Stage of the city's history. We trace the path that followed its growth. Beaches of Barra, Recreio, Macumba, Prainha and Grumari. Place of beaches and some deserted. Visits to the Grove Barra and Chico Mendes Park. 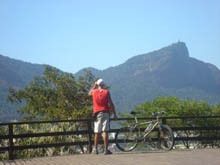 The lake is surrounded by various parks including the Tijuca Park. Its margins forming a heart. Visits in Botanic Garden and Adventure Park. 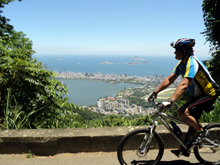 The edge of Niterói has magnificent landscape of Rio. 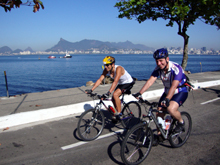 We went through Icaraí, San Francisco and Jurujuba beaches arrive at the main fortress of Guanabara Bay. Visit the MAC. 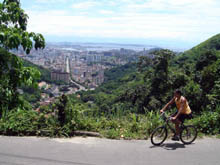 In Alto Leblon, this park is home to various viewpoints together in a single landscape Lagoon, Corcovado, the Botanical Garden, and the beaches. Sculptures by Oscar Niemeyer. 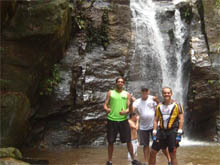 The waterfall is located in Tijuca National Park. Its crystal clear water and ice is perfect for bathing on summer days. A trail of 20 minutes separates the asphalt road. Joatinga is still a wild beach that's the impression of being in a country town. It is a place to relax and enjoy the look with safety, comfort and tranquility. Beaches Sossego, Piratininga, Itaipu, Itacoatiara and Camboinhas. Local indigenous communities that exist today. The border is full of bars experts in seafood. The Paineiras has beautiful lookouts, a natural fountain, waterfalls and an old hotel president. It crosses the Atlantic forest reforested by Dom Pedro II in the XIX century. Path built for the frequent tours of the Royal Family. At the top there is the viewpoint of the Bureau of the Emperor. It is common to see wild animals on the road. 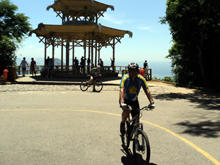 One of the highest points with 710m to go from pro bike Corcovado is a challenge for any rider, the reward is a spectacular panoramic view at the feet of Christ the Redeemer. You can view the antennas across the city. Raising exotic and dense vegetation makes it more pleasant to the road cycling. The summit regularly crosses the entire mountain. For more information, make a reservation and purchase a replacement bicycle. Contact Us. the newsletter Via Pedal with news from the site. All rights reserved by Via Pedal Expedições e Turismo Ltda.